Posted byWholeDude	 July 30, 2015 July 30, 2015 Leave a comment on WHAT IS KARMA? WHAT IS KARMA? The Land of India or Bharat Varsha is traditionally identified as ‘KARMA KSHETRA’ or ‘KARMA BHUMI’.Human Existence is operated by the ‘Law of Karma’. The Sanskrit word ‘KARMA’ describes the totality of a person’s actions in any one of the successive states of that person’s existence. The ‘Law of Karma’ governs all action and its inevitable consequences on the doer. The ‘Law of Karma’ determines the consequences on the doer not only during the course of his current existence but also during the course of the next successive states of future existence. In whichever manner an individual chooses to act, the action may have been predetermined by his past Karma. In this sense, Karma could be described as the root cause of any action or event. The word FATE or DESTINY is described in Sanskrit language as ‘DAIVAM’,’BHAAGYAM’, ‘NIYATI’, and ‘VIDHI’. Fate or Destiny is the Power or Divine Agency that determines the outcome of events before they actually occur. Fate or Destiny determines what happens or has happened to a person during his past, present, or future existence. Very often, people are confused about the relationship between the concept of Karma and the concept of ‘Daivam’, or ‘Vidhi’ which is popularly described as Fate or Destiny. People very often invoke the concept of Fate or Destiny to explain only when something inexplicable and unexpected happens in one’s life. The belief in a Supreme Being and the belief in God as the ‘Prime Cause’, and the concept of God’s Will are slightly different from the concept of the Power represented by Fate or Destiny. God will not contrive the actions of an individual for His own benefit. God has the intrinsic ability to execute His own Plans. It is the individual’s Karma ( from present and past stages of existence ) that determines his Fate or Destiny in the next and subsequent stages of existence. The Power or Agency of Fate or Destiny is not operated by the individual but by a Divine Strategy. The individual has no control on the Divine Strategy. A person can exercise control over his own actions but cannot modify the manner in which the consequences for his actions manifest. The consequences for the actions in one’s own life may manifest at an unknown time, in an unexpected manner strictly according to the Divine Strategy, the Power or Agency that administers Fate or Destiny. Karma literally writes the Fate or Destiny of an individual and yet they may not be used as synonyms. However, it would be correct to attribute any inexplicable event to the doings of Karma or Fate/Destiny. Because of this deep-rooted belief in inevitability of consequences on the doer, the Land of Bharat or India is identified as ‘Karma Kshetra’ or ‘Karma Bhumi’ where the ‘Law of Karma’ is enforced upon all living and non-living entities. Since most living entities are dependent upon Sun for their biological existence, the Sun God or Lord Surya is also known as ‘Karma Saakshi’ which means that Sun is a Witness to all of our activities( Karma) during our physical existence. In the ‘AfterLife’, if an individual has to be punished for his actions, a divine entity known as Lord Yama or ‘KARMAKAR’ imposes punishment strictly according to Karma. The idea or concept of Karma is firmly associated with the idea or concept of ‘SAMSARA’ and the belief that a living entity has existed in the past, and would continue to exist in the future and death is viewed as transition from one stage of existence to the next. Karma encompasses all actions performed by the organs of Karma known as ‘Karma Indriya’. These are identified as hands, legs, feet, speech( Vaak), ‘Paayuvu’, and ‘Upastha’. The last two describe bodily functions associated with excretion and reproduction. In the West also there are stringent laws to protect people from offensive behavior. Lewd public behavior is prohibited by law. Karma describes a variety of activities. It includes occupational duties and work, rituals and ceremonies particularly in the context of death and mourning, the rituals of sacrifice such as ‘Havan’ or ‘Yajna’, the interest paid on a loan or debt, the struggle or effort to safeguard existence ( ‘YATANA’ ), the good deeds ( ‘PUNYA’ ), and the sinful activities ( ‘ Paapa’ ). An individual is expected to exercise control on his ‘Organs of Karma’ and this attitude of self-restraint is described as ‘Indriya Nigraha’. An individual has no foreknowledge of his own Fate/Destiny and the only manner by which he may shape the future events is by choosing appropriate Karma according to the ‘Laws of Right Conduct’ described in Sanskrit language as ‘DHARMA’. Karma operates like a Bank Account. An individual entity comes into existence with a Credit Balance of Karma known as ‘SA BEEJA KARMA’. This Credit Balance represents the Account Balance that is carried Forward from the individual’s previous existence. An individual’s physical existence may end with death, and the Karma Account would not be permanently closed and the Balance is carried Forward and represents the Beginning Balance with which an individual begins a new journey in the cycle of Life -Death – and – Life. Whenever, an individual actually experiences the consequences of his past Karma, the Karma that is withdrawn from the Karma Bank Account is called as ‘PRARABDHA KARMA’. The individual actually tastes the Fruits of this Karma and hence it is also known as ‘KARMA PHAL’. The taste of the Fruit depends upon the nature of Karma that is being consumed by the individual.The experience of Prarabdha Karma has direct consequences as it afflicts the human body in its present state of existence. Individual has no choice in matters concerning this Withdrawal. Individual cannot control the Amount of Withdrawal, the Time of Withdrawal and the effects of the Withdrawal. The Authority which administers the Bank Account makes all the decisions in the manner a Karma Account is operated. The individual during the course of his existence would be continuously replenishing his Karma Bank Account. This Credit Balance in the Karma Account is known as ‘AGAMI KARMA’. This Balance is not yet Withdrawn and is held in store until such time the individual gets a chance to experience its Fruits. Agami Karma represents an individual’s Pre Destination of which the individual has no foreknowledge. It is not exactly ordained by God. It is only operated by a Strategy which chooses its own Plan to deliver this Agami Karma to the individual from his own Credit Balance. When the Karma Bank Account’s Balance becomes ‘ZERO’, the individual is promptly released from its shackles and entanglements. Such Liberated individual Entity would gain his total independence from the Cycle of Life-Death- and Life. The Purpose of Life and Human Existence is ultimately that of eliminating the Balance in the Karma Bank Account and a Zero Balance is the Goal to be obtained. The idea of ‘Liberation'( Moksha ) or Salvation is unlike a reward or punishment and should not be confused with the concept of ‘Heaven’ and ‘Hell’. Liberation requires that there should be no ‘credit’ ( positive Karma ), or ‘debit’ ( negative Karma ) Balance in the Karma Bank Account. WHAT IS KARMA? 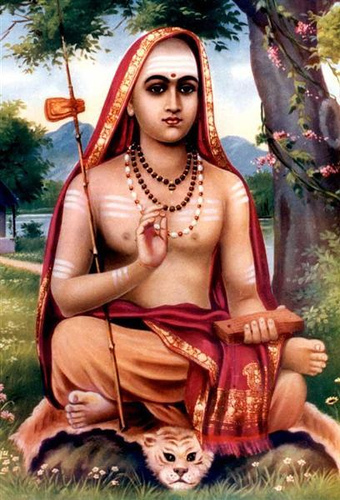 Adi Shankaracharya had described the True Identity of SELF and separated himself from his Body, and Mind with its Five organs of Karma. It may not be easy to empty the Karma Bank Account as the individual could only make deposits into his Account and the Account is withdrawn under a Plan operated by Daivam. Adi Shankaracharya had described the True Identity of SELF and Self-Knowledge is the key to obtain ‘RELEASE’ or ‘VIMOCHAN’ or ‘MUKTI’ from the entanglements of Karma. He had asserted that the Five Organs of Karma known as Vaak(organs of Speech ), Paanee( Hands ), Paada( Feet ), Upastha( organs of reproduction ), and Paayuu( organ of excretion ) would “NOT” describe his True Identity. WHO CAN OPPOSE DESTINY ? Daasiinaam Raavanaasya aham marShayaami iha durbalaa. Mahaabaaho=O’ the Great Armed( Hanuman), maa vada= do not speak, evam=like this, eshaa= this, paraa hi= it is indeed great, Daivii gatiH= Divine Strategy, Nishchitam= it was decided, iti=that, idam= this situation, praaptavyam=is to be obtained, ma yaa= by me, durbalaa= feeble, aham=(as) I am, marshayaami=giving protection from retaliation,daasiinaam= the servant-maids, Raavanaasya= of Ravana, iha=here. It is very interesting to note that Princess Seetha had specifically chosen the phrase “Mahaa baaho” to glorify the physical prowess of Hanuman. He had merely asked for Her permission to punish the female demons and it is absolutely clear that no physical effort is truly required on Her part to execute that punishment. And yet, She claimed that She would not consider punishing the servant-maids just because of Her own physical weakness. In saying so, She is actually suggesting to Hanuman that He must also consider Himself to be physically feeble and should not engage in any action with an intention to counteract the doings of Fate. Princess Seetha has delivered a clear message to all living entities and reminded all of us to realize the ineffectiveness of our physical abilities and the Superiority of the Divine Power which governs Fate/Destiny. In her concluding remarks, Princess Seetha has further instructed that it is incorrect to respond to evil with evil. No evil is to be done, even to those cruel persons of sinful deeds, who take pleasure to harm others and continue to perpetrate their sinful acts. Kindness is to be shown by a noble person either towards a sinner or to a virtuous person or even to a person who deserves death, for , there is none who never commits a wrong. Virtuous persons value good conduct as an ornament. A Superior person does not take into account the sin of those who have committed an offense or a transgression. 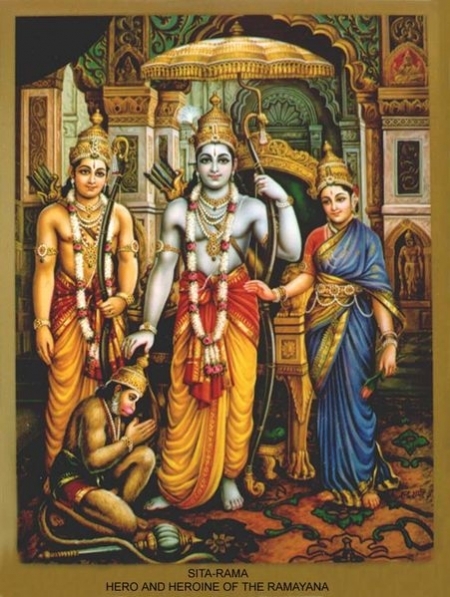 The epic poem of Ramayana firmly establishes the concept of Karma and the inescapable consequences of Karma and the role played by Daivam, the Divine Power which is manifested as Fate/Destiny and supports an attitude of humility and submission to the Divine Strategy. 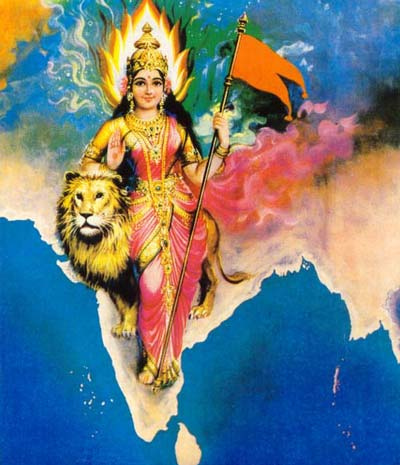 The ideas and concepts that originated in the Land of Bharat or India are secular. None of the concepts demand that the individual must worship any particular God. While embracing these ideas and concepts, Indians are free to worship a God of their own choice. Apart from a Divine Entity, Indians are free to choose a living entity or even a physical entity for an act of Worship and Devotion. The ideas or concepts of Karma, Fate/Destiny, Satya (Truth), Dharma ( Right Conduct), Samsara, Mukti, Moksha(Liberation) are not attached to any particular God. The ideas of Karma and Fate/Destiny do not demand absolute Faith in a particular God. The idea of Karma describes the activities of an individual and its consequences upon the individual. God is not involved in this idea. The idea of Fate/Destiny involves an unknown Supernatural Power or Agency and the Strategy used by this Agency. God does not contrive or conspire to cause an unfortunate event. In the epic poem of Ramayana,Prince Rama and Princess Seetha being reincarnations of Vishnu and Lakshmi, had arrived upon planet Earth for their earthly existence without any Credit Balance of Karma and the mechanisms of Karma were not responsible for unfortunate incidents in their lives. They had behaved and acted like ordinary mortals and hence we should not be surprised by Princess Seetha’s remarks about any misdeed She may have committed in Her prior life as an explanation for the sufferings She had endured. The entire Story was set into motion by a Divine Strategy and the principal players were not directly aware of that Strategy which would unfold in their lives with direct physical consequences. Ordinary mortals would be better off by contemplating upon their misdeeds and seek redemption and obtain protection from the Energy/Power/Force of Mercy, Grace, and Compassion described as ‘KRUPA’. The idea of Karma helps us to accept a sense of personal responsibility for any action that we perform, shapes our attitudes, controls our behavior, and strengthens our character.